The geographic area in urban Denvier known as the Golden Triangle to local residents, is one of the oldest and most interesting neighborhoods in the city. This diverse neighborhood is loosely defined as the area bounded on the north by Colfax, the west and south by Speer and Broadway on the east. Civic Center Park anchors the northern portion of the neighborhood. This is home to several major city, county and state buildings, along with several museums and theatres. Civic Center Park itself is the focal point for cultural and civic events and activities in the Golden Triange. It is the central location for many annual events, from the annual Parade of Lights during the holidays to Cinco de Mayo to outdoor musical and theatrical performances throughout the summer. The Golden Triangle's residential area that is south of the Civic Center Park area still boasts single family homes and bungalows building in the late decades of the 1800's through the early 1920s. While many of these original homes were bulldozed after World War II, the remaining residences still create a turn of the century feeling in the neighborhood, while welcoming new loft and condominum developments and a new generation of urban dwellers. 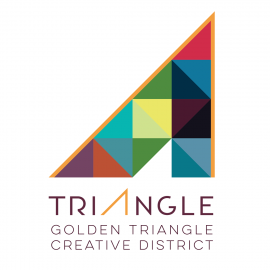 Several of the original buildings are being recycled and reinvented, starting new lives as restaurants and art galleries and attesting to the vitality of the Golden Triangle neigborhood. ***FOUNDERS LIVE DENVER IS BACK AND OUR FOUNDER NICK HUGHES IS IN TOWN! *** We are still looking for a few female presenters for this event. Contact the organizer if you are interested in presenting your startup! FREE Pedicab Party @ the Diamond Cabaret! Enjoy some F&B on the house! !